I had two free passes to The Museum of Modern Art left over from my cushy office job. Even though I am broker than someone who sells houses [get it?] I decided it would make sense to go out to lunch. 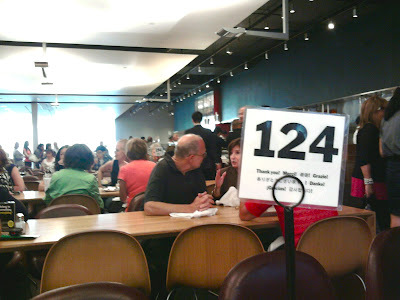 After wading through all the Matisse, we were simply desperate for the Cafe. "Is the calamari fried," I asked the woman at the register. "It's grilled - do you have a gluten allergy?" she said, without my prompt. I was impressed - and comforted. There is something to be said for eating out without clenching one's stomach in toxic fear the entire time. 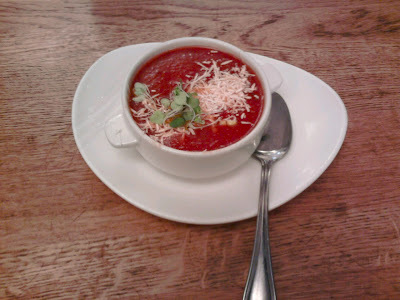 We were starving and chilly from all the AC and decided to share this tangy tomato soup (above). When the waiter brought it over he said - "GLUTEN ALLERGY, NO BREAD." Love it. 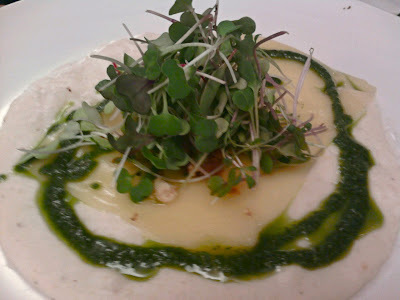 The best dish, hands down, was the creamy polenta. Walnuts - who'd have thought? And cheese, of course. HIGHLY RECOMMENDED. It is more than enough to share. 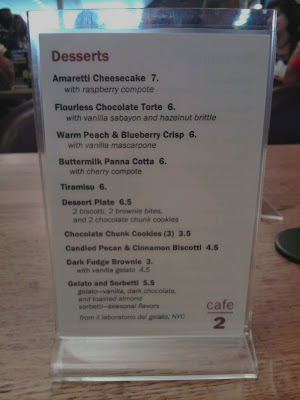 We shared the salad plate (choose three, $10) which was nice but nothing to the polenta. 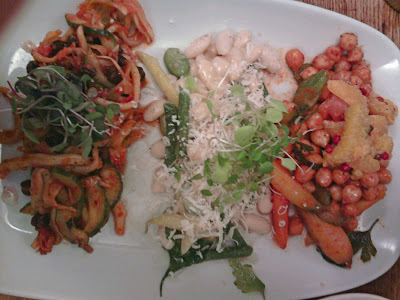 I love beans as much as the next person but these salads all tasted kind of the same: vinegary and a little dry. We didn't get dessert, but please note the availability of three gluten-free options: panna cotta, flourless chocolate cake, and gelato! OH, and the Picasso room was enlightening, too.